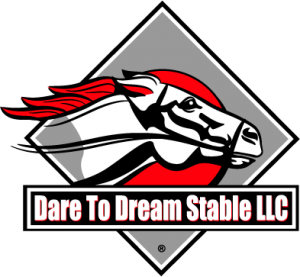 Advancing the concept of horse racing partnerships in Thoroughbred racehorses, that is the goal of Dare To Dream Stable. The thrills, drama, pageantry and mystique of owning a thoroughbred racehorse are second to nothing else in the world. Our members are afforded the opportunity to participate in the Sport of Kings without risking a king’s ransom. In the past, only the extremely wealthy were able to participate as owners in thoroughbred horse racing. This was due to high initial cost of purchasing a thoroughbred along with the costly monthly expenditures of training, shoeing, feeding, and veterinary care. By joining a partnership at Dare To Dream Stable, you can experience all of the thrills and enjoy all of the benefits of ownership at an affordable price. This is accomplished by spreading the financial risks of ownership across the rest of the partnership. In turn, you also enjoy the increased purchasing power of the combined assets of the partnership, which provides the opportunity to enjoy higher quality horses. The operating principles for our horse racing partnerships are intended to allow us to have fun and give us the most reasonable chance to make a profit. First, we want to have fun. That means getting together at the races, getting to visit our horses on the backstretch, watching morning workouts and generally enjoying being in the racing game. There is no better thrill! Second, we’re all involved in the fun, drama and strategies of this great sport. We discuss, via email, which horses to buy/claim, where they should run, whether we should sell, etc. The Manager has the final say on all racing related issues, but will take into serious account the opinions and wishes of any consensus amongst the members. On all non-racing issues (i.e., naming of horses, etc.) we will vote. Through our discussions, the Manager will make every attempt to make this an educational experience as well as a fun one for all the members. Third, we try to keep our costs to a minimum. Unlike some of the “big players” in the industry, there are no ongoing management fees and no markup on training, vet bills or medications. By keeping costs low, we make it at least possible to be profitable. Aside from having fun (and hopefully being profitable), we are committed to being responsible owners. We will do what’s right and in the best interest of the animals and people that compete in this great sport. Our stable roster usually reflects a diverse mix of horses ranging from yearlings to some seasoned track veterans and low-level claimers to Grade 1 Stakes winners. We are headquartered in Libertyville, IL, just a few minutes from Arlington Park. We have been very successful by industry standards as we are way above the industry averages statistically. We have won races at Churchill Downs, Del Mar, Arlington Park, Aqueduct, Hawthorne Racecourse, Fair Grounds (New Orleans), Gulfstream Park, Oaklawn Park, Evangeline Downs, Mountaineer Park, Canterbury Park, Philadelphia Park, PARX Racing, Penn National, Pimlico, Beulah Park, Tampa Bay Downs, Stockton, Delta Downs, OBS (Ocala, FL), Hoosier Park, Lone Star Park, Prairie Meadows, Turfway Park, Delaware Park, Indiana Downs, Presque Isle Downs, Colonial Downs, Charles Town, Louisiana Downs, Calder Racecourse, Laurel Park, Santa Anita Park and Keeneland Racecourse. We have run in numerous Stakes races (with 25 stakes wins and numerous placings) in California, New York, Illinois, Kentucky, Louisiana, Texas, Florida, Iowa, Pennsylvania, Maryland, Minnesota, Virginia, West Virginia and New Jersey.